Recognised by the Zero Project as an ‘Innovative Policy on Accessibility‘ in 2014, Australia’s Development for All: Towards a Disability-Inclusive Australian Aid Program supports people with disabilities to improve the quality of their lives through accessing the same opportunities for participation, contribution, decision making, and social and economic well-being as others. By including people with disability in the development process, the strategy recognises their potential, values and respects their contributions and perspectives, honours their dignity and responds effectively to their needs. Australia’s aid program is now managed by the Department of Foreign Affairs and Trade (DFAT) and Development for All is integral to Australia’s sustainable development operations in helping to improve the wellbeing of some of the world’s poorest people. In 2008, Development for All: Towards a Disability-inclusive Australian aid Program was released to guide the work of the then Australian Agency for International Development. The primary goal of the programme is to ensure that persons with disability are included in and benefit equally from Australia’s sustainable development assistance, both domestically and internationally. The programme ensures that people with disability are included, contribute to, and benefit equally from development efforts. The programme has provided 5.5 million USD to support disabled people’s organisations globally (2009-2014). In many countries, discrimination and exclusion of persons with disabilities from basic services remains a huge challenge. Development assistance can help to improve the situation. Among the countries who give the most official development assistance, only a few, including Australia, have mainstreamed disability into their development programming. Australia’s strategy, Development for All: Towards a Disability-inclusive Australian Aid Program, is not a stand-alone disability programme, rather it is about improving the reach and effectiveness of development assistance by ensuring that people with disabilities are included in, contribute to, and benefit equally from development efforts. For example, Australia mainstreams disability into its development programming, in particular in its education and infrastructure programs and guidance on how to apply the universal design to its aid programme has been published. Furthermore, the Australian aid program provides comprehensive support for partner governments’ efforts towards disability-inclusive development as well as to disabled people’s organisations. By ensuring that education and infrastructure development projects in particular take the needs of persons with disabilities into account, and are inclusive and accessible for all, the strategy helps actors to work more efficiently. The strategy focuses on persons with disabilities who are generally a marginalised and vulnerable group, which experiences many human rights violations. The strategy also pays specific attention to children, youth and gender. By improving access to water and sanitation, education, etc., the strategy produces positive impacts on human health. The strategy also addresses non-communicable diseases such as diabetes, polio, avoidable blindness, as well as road safety. Led by NGOs, a core group of stakeholders in disability and development (politicians, academics, etc., now referred to as the Australian Disability and Development Consortium ‘ADDC’) laid the foundations for a draft strategy. It was the first strategy that took the Committee on the Rights of Persons with Disabilities (CRPD) and the motto of the disability movement ‘Nothing about us without us’ into account. Consultations on the draft strategy were held with information in accessible formats. They were broad and included all recipient countries, as well as 14 Department of Foreign Affairs and Trade (DFAT) posts. Over 500 submissions were received. For the strategy’s implementation, DFAT consults with the ADDC and in particular with the NGO CBM, which in turn partners with the University of Melbourne – a clear cross-sector partnership. In 2011, the disability-inclusive reference group was established which advises on the implementation of the strategy. The main focus is on educating, training and capacity building for DFAT staff and DPOs, to then hand over responsibility and funding for project implementation and to build on successes achieved. The strategy set up several mechanisms for its fair, effective and transparent implementation. For example, DFAT continues to build staff capacity and keep up with expertise. DFAT also established the Disability-Inclusive Development Reference Group that is regularly convened. DFAT then produced a series of guidance notes for different areas of development work. Working closely with other department. as well as other donors, NGOs and disabled peoples organisations (DPOs). Finally, DFAT includes in each contract a clause on data collection for the purposes of monitoring. Programmes funded by DFAT undergo monitoring and performance assessments. In case of abuse, NGOs or DPOs risk losing future support. The strategy focuses on people-centred development by making sure that there are multiple layers to capacity building in the recipient countries, from the bottom to the top. The strategy puts forward funding for disability-inclusive development and places a strong emphasis on the involvement of DPOs while supporting a number of them. Increasingly, DFAT’s staff includes persons with disabilities. The strategy’s main goal is to reduce the inequality experienced by people with disabilities. Other donor countries have taken inspiration from Australia’s strategy. For example, DFAT has trained a member of the German development agency (GIZ) and in 2015 we will train somebody from UK’s development agency (DFID). The United Nations Convention on the Rights of Persons with Disabilities (CRPD), which was adopted by the UN General Assembly on 13 December 2006 and came into force on 3 May 2008. Australia ratified the Convention on 17 July 2008, one of the first developed countries to do so. This affirmed Australia’s long-standing commitment to upholding and safeguarding the rights of people with disability. Later in 2008, ‘Development for All: Towards a Disability-inclusive Australian Aid Program’ was released to guide the work of the then Australian Agency for International Development. Australia’s aid program is now managed by the Department of Foreign Affairs and Trade (DFAT). ‘Development for All’ is integral to sustainable development and to improving the wellbeing of the world’s poorest people. In preparing the strategy, AusAID conducted consultations in over 20 developing countries in which the Australian Government provides development assistance, involving people with disabilities, their families and caregivers, government representatives, non-governmental organisations, and service providers, and using alternative formats. Almost 500 written submissions were received. During the consultations, overseas-based Australian government staff were supported to engage with local disabled people’s organisations and integrate their contributions. The primary goal of the programme is to ensure that persons with disabilities are included in and benefit equally from Australia’s development assistance, both domestically and internationally. The strategy aims to support the participation of persons with disabilities in economic, social and political life to reduce poverty, increase economic growth and enhance democratic governance. 1. People with disability are to play an active and central role in AusAID’s work. 2. To recognise, respect and promote the rights of persons with disabilities. 3. To promote, respect and understand diversity. 4. Interaction between gender and disability is taken into account. 5. To focus on children so that current and future generations will be involved and benefit from the programme. 6. Actively promote and support people-to-people links and partnerships. Fosters initiatives through a range of flexible and responsive support programs such as volunteers, Non-Government Organisation agreements, research, leadership awards and scholarships, sports and small grants. Reduced preventable impairments by focusing first on avoidable blindness as well as road safety. Ensuring DFAT is an open, accessible and inclusive organisation. Guidance notes for different sectors of development work have been prepared, including on accessibility, education for all, social protection, law and justice, health, and investment. In particular, in January 2013, the ‘Accessibility Design Guide: Universal design principles for Australia’s aid program – A companion volume to Development for All’ was launched, which contains 11 technical annexes of practical guidance, each of which include checklists, diagrams and examples to help development practitioners integrate universal design principles into different thematic areas of the aid programme. To ensure that disability is a consideration in DFAT’s programme management, design and evaluation systems, a Disability Policy Marker was included in the data management systems in 2012. It complements work by systemically tracking disability inclusion across the aid programme through existing quality processes. For further development, DFAT is currently working on a performance assessment framework for disability-inclusive development to provide an informed basis for country programs to monitor and report on their work in disability-inclusive development as well as to collect disability-disaggregated data. Progress will be measured at the strategy, sector and country programme levels, and performance measures, including targets and indicators, will be developed for each level in line with activity plans. The establishment of DFAT’s Disability-Inclusive Development Reference Group which ensures that the voices of persons with disabilities are taken into account in development policy-making and programming. In general, DFAT is seen as the lead donor on disability-inclusive development, with its funding commitment and dedicated staff as the key to success. In 2012, an independent mid-term review of Development for All was released. It found that DFAT had made ‘considerable and impressive’ progress towards becoming a more inclusive aid programme and it strongly supports the direction that DFAT has taken under the strategy. DFAT’s management provided specific responses to each of the 10 review recommendations and agreed to all of them. All State Parties to the CRPD are therefore obliged to mainstream disability into their development programmes. Whilst, there are several other countries that are encouraging that emergency aid and/or relief payments are mainstreaming the inclusion of disability, Australia has gone a step further. The country developed and adopted a systematic, thorough and effective strategy that can serve as an example to aid and donor organisations worldwide. In particular, the Report underlined that Australia’s support is bolstering partner Government’s efforts, such as in Papua New Guinea, Cambodia and Timor-Leste, towards more equitable national development that benefits all citizens, including people with disability. Investment in leadership by people with disabilities, together with advocacy by Australian leaders internationally, is helping to increase the priority of, and resources for, inclusive development globally. 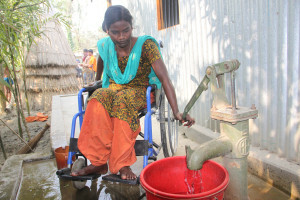 Development for All: Towards a Disability-Inclusive Australian Aid Program. The Parliamentary Secretary for International Development Assistance, Bob McMullan MP.